Following is a Civil War letter of my gr. gr. 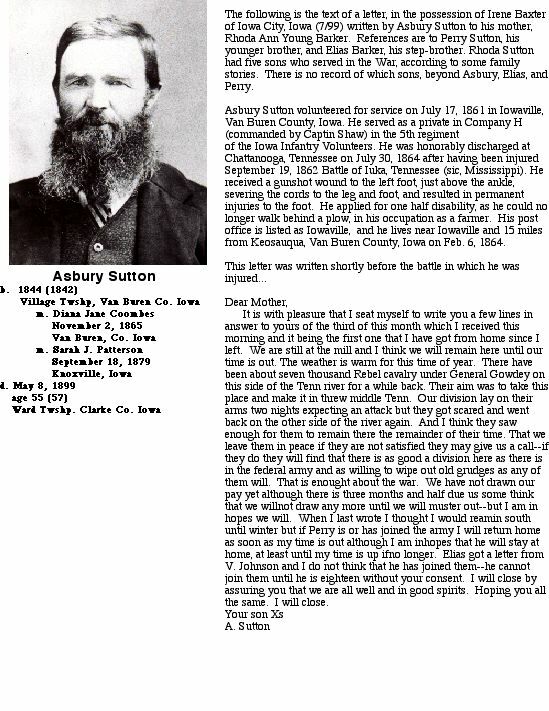 grandfather Asbury Sutton, of Iowaville--written to his mother Rhoda Young Barker Sutton, who ran a boarding house in Iowaville at the time. The letter is written shortly before he was wounded in the Battle of Iuka. In the letter he mentions his step brother Elias E. Barker, brother Perry Sutton, and a friend Van Johnson. Rhoda Sutton had four sons who served from Van Buren Co. in the Civil War Peter Barker (36th), Elias Barker and Asbury Sutton (5th), and Perry (45th).